The Ghana Institute of Engineering (GhIE) and the Ministry of Environment, Science, Technology, and Innovation (MESTI) have announced the establishment of Technology Design and Manufacturing Centers (TDMCs) to help bridge the technology gap in the country. The Centres, when established, will help achieve government's Ghana Beyond Aid agenda and youth employment. 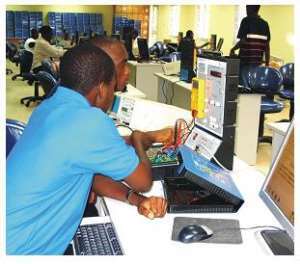 These centers will support national research institutions, universities and industry to help bridge the technology gap in Ghana through the deployment and active use of technology, the training and mentoring of engineering practitioners and technicians. This was said at a press conference by GhIE and MESTI under the theme, "Bridging the Technology Gap Towards ‘‘Ghana Beyond Aid’’ and Youth Employment." According to the Minister of Environment, Science, Technology, and Innovation, Kwabena Frimpong-Boateng, a conference was held in Peduase on the national vision for science, Technology, and Innovation to experienced practitioners in science, technology and innovation (STEI) resident in Ghana. He added that the Peduase conference underscored the urgent need to put in place a domestically driven technology to achieve the Ghana Beyond Aid by building a resilient, dynamic self-reliant economy that generates employment for the youth. The conference, however, envisioned that the TDMC will serve as a repository for reports on research conducted in Ghana; house a database on Ghanaian engineers, technologists and scientists worldwide and their areas of expertise; provide opportunities for the commercialization of inventions and innovations into commercially viable products and serve as center for upskilling of engineering practitioners. Other functions include serving as a center for promoting and protecting intellectual property and patenting Ghanaian innovation; serve as a center for engineering analysis and a place for Design-for-Manufacturing Assembly (DFMA). According to him, it will also serve as a ‘‘learning factory’’ where practice, education, and research are integrated to foster the development of competencies of trainees and practitioners. "A forum engagement where the experience of the leaders are communicated to professional beginners and the knowledge of academia and research, and the bolt and nut practices of the industry come together to stimulate learning and practical application for the benefit of society."